NOTE: This is Part Two of a series about Plan-B Theatre, which offers a glimpse of the four new productions for the 26th season. For Part One, see here. Enigmas and mysteries – two wrapped with music and a third with the perplexing question of whether a murder actually did happen – will comprise a trio of new productions for Plan-B Theatre’s 26th season. There also will be a new play about food and body image to continue the widely praised series of kid-oriented plays that the company will present this fall in the Free Elementary School Tour (FEST) program, which reaches thousands of students in Salt Lake and Davis counties. 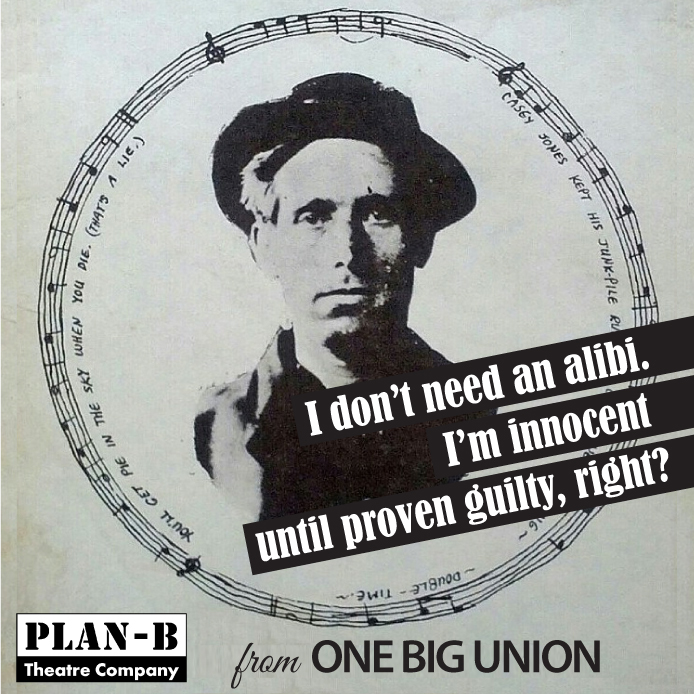 History leads the way with the world premiere of One Big Union (Nov. 10-20), a play by Debora Threedy that enriches the story of Utah’s Joe Hill (1879-1915), a folk hero of the American labor movement who was executed 101 years ago for a murder that authorities claimed he committed although the evidence never confirmed this. Hill’s life story has never been really verified but his legacy has been fortified through songs by musicians inspired by the Hill legend and, more importantly, his own compositions that have become timeless and relevant as new generations discover their lyrics and themes. Threedy, a professor at the University of Utah’s S.J. Quinney School of Law, has a strong feel for bringing historical figures and themes to the stage with credible impact as fictional treatments, thanks to deep research that highlights primary archival sources. In three previous plays for Plan-B, she earned well-deserved critical praise for stories touching variously on the lives of Everett Ruess, Wallace Stegner and the relationship between Sally Hemings and Thomas Jefferson. The last play The Third Crossing was among the winners of the Fratti-Newman New Political Play Contest in New York. One Big Union will have its first public look this summer at the Utah Shakespeare Festival’s New American Playwrights Project. Ten years ago, Threedy had the Ruess play that became The End of the Horizon workshopped at the same venue. “Threedy has a particular skill in working with stories about individuals who are well known but about whom little is known about their personal lives,” Jerry Rapier, Plan-B’s artistic director, adds. Her newest work, with a cast of six actors, will include Hill’s music in a show musically directed by David Evanoff, choreographed by Stephanie Howell and directed by Jason Bowcutt. One of Hill’s iconic songs includes “The Preacher and the Slave,” known especially for the following lyrics: You will eat, bye and bye/In that glorious land above the sky/Work and pray, live on hay/You’ll get pie in the sky when you die. One hundred years ago, the edition of The Little Red Songbook (from the International Workers of the World of which he was a member) published after Hill’s execution was dedicated to him and included some of his songs. Labor officials often taught the melody to workers as song leaders — a practice evident in performances up to today by American folk song artists including Joan Baez and Zilphia Horton. 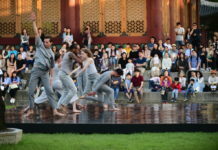 Plan-B’s winter production swings back nine centuries in Virtue (Feb. 16-26, 2017), a play about Hildegard of Bingen (1098-1179), a Benedictine abbess who was one of the earliest known women composers and a fascinating public intellectual whose religious mysticism was the topic of frequent debate with popes and emperors throughout her long life. One of her most definitive literary works is Scivias, a compilation of 14 extended poems in which she describes 26 revelations that came in visions. She wrote treatises on science and medicine, allegorical religious works and on the lives of saints including Disibod and Rupert. Her life and work are marked by a freedom that appears uncharacteristic and remarkable for its time. 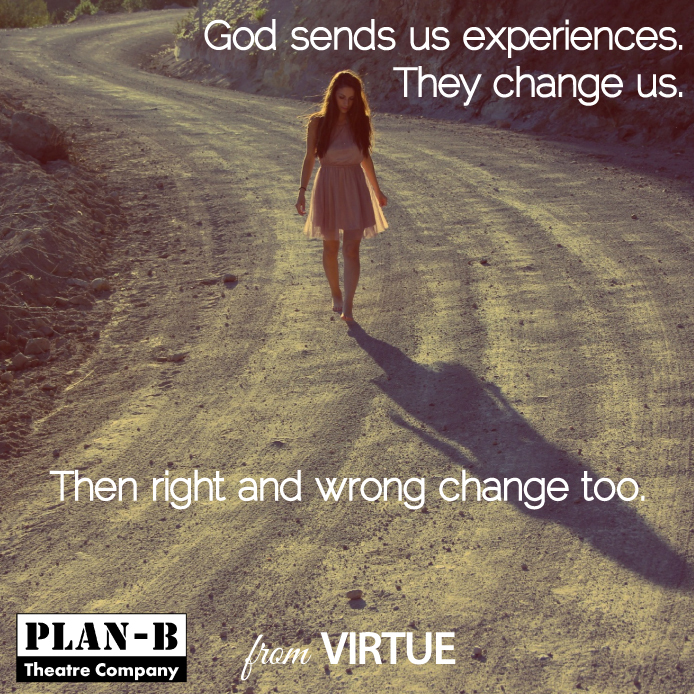 Virtue is written by Tim Slover, a playwright who wrote Joyful Noise and who also is on The University of Utah’s department of theatre faculty. The play is being given its first fully staged production in Utah. In 2014, it was performed as a staged reading (with scripts in hand) as the inaugural offering for the Ellen Arnold Groff Studio Series at the Fulton Theatre in Lancaster, PA. Slover’s play also has been performed similarly in various venues around the country, including The Julliard School and at the University of Utah. “Like Threedy, Slover has a particular skill in writing about historical figures in the same way, by filling in the gaps with what could be seen as plausible,” Rapier says. The production, which focuses on Hildegard’s relationship with Richardis, a penitent, will also include music. Among Hildegard’s musical works is, as described by New York Times critic Allan Kozinn, a morality play, Ordo Virtutum, in which the soul is tempted by the Devil, but is persuaded back to the right path by the Virtues. One of the best recordings of Hildegard’s music is a 1995 Deutsche Harmonia Mundi release recorded with Sequentia, which, as Kozinn suggests, really gives vibrant context to Hildegard’s music. Her musical language, like her contemporaries, was monophonic and written long before the modern system of keys and scales had been developed and before harmony and polyphony had been worked out by composers. Kozinn also recommends a pair of other worthy recordings of her music: A Feather on the Breath of God (Hyperion, 1984), a varied overview, beautifully rendered by Gothic Voices; and 11,000 Virgins (Harmonia Mundi USA, 1997). 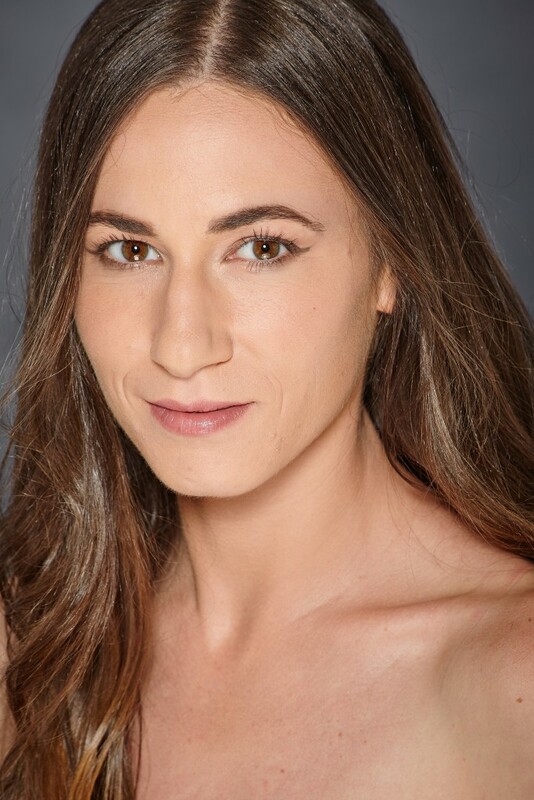 The spring premiere will feature the third in the series of works by Utah playwrights 35 and younger, who were tapped as commission winners by the David Ross Fetzer Foundation for Emerging Artists (The Davey Foundation). Morag Shepherd’s Not One Drop (March 23-April 2, 2017) features two women that brings every possible source of relationship drama and baggage into the picture. 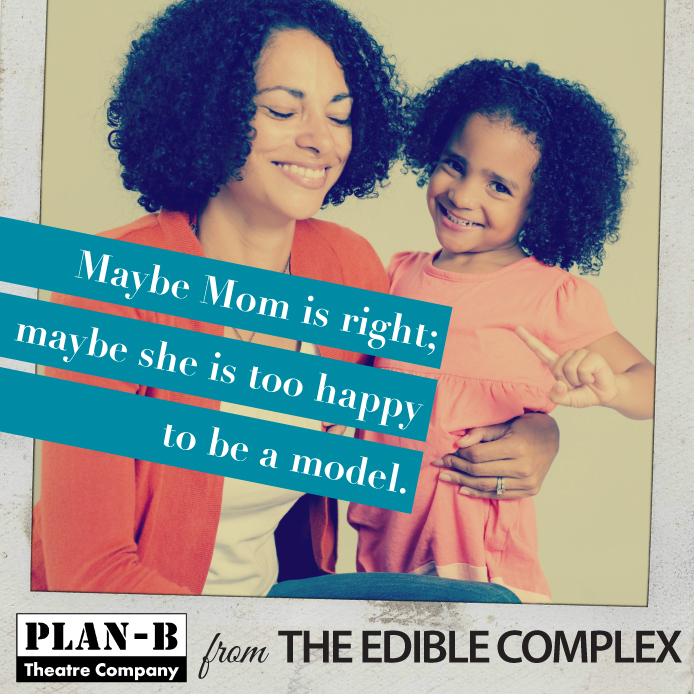 The 26th season will formally open with The Edible Complex by Melissa Leilani Larson, a play written for children in grades 4-6 and is the latest installment in Plan-B’s successful FEST series. Larson’s story focuses on Anna, 11, who truly enjoys good food and aspires to becoming a chef. However, she becomes more focused on her body image and decides to stop eating. Larson sets the stage for various food items who are talking back to Anna. The play will premiere Oct. 8, 2016 as part of RDT’s Ring Around the Rose Series before going on to be performed at more than 40 schools in October and November from Weber to Juab County and in Davis County, in conjunction with the Davis Arts Council. 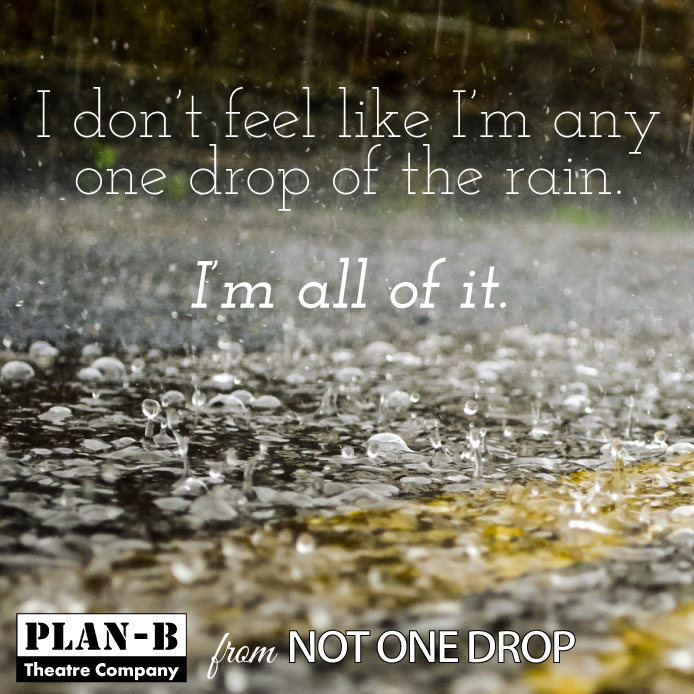 Plan-B also will offer three Script in Hand Series programs. All readings are free but tickets must be reserved in advance. Titles announced and tickets available Aug. 1. Season subscriptions are now available here at $53 for the three productions and an addition $6 for The Edible Complex.